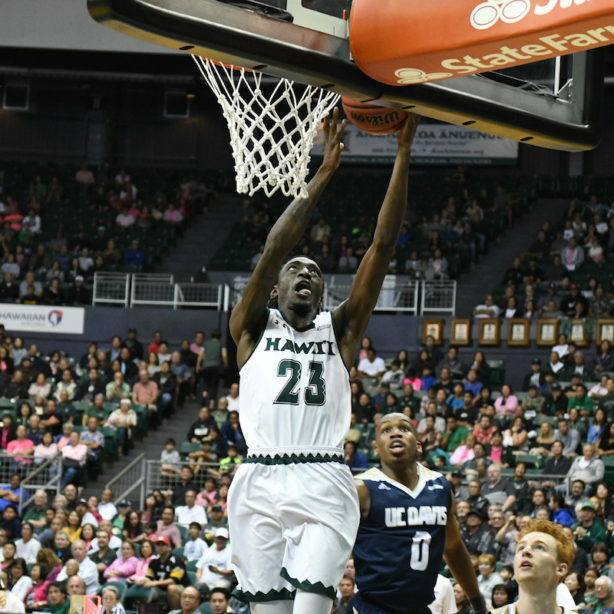 With an all-around game that looked quite pretty in pink the final 25 minutes, Hawai’i pulled away from visiting UC Davis, 80-60, Saturday night in Big West Conference men’s basketball action. A spirited “Pink Night” crowd of 6,265 — many wearing pink in support of breast cancer awareness — at the Stan Sheriff Center watched Sheriff Drammeh score a game-high 18 points and Zigmars Raimo add 14 points as the Warriors improved to 12-7 overall and 3-2 in the Big West. Dawson Carper added 13 points and five boards off the bench and Drew Buggs notched 12 points, 12 assists and four rebounds. Matt Neufield scored 17 points and grabbed six rebounds and AJ John added 16 points for the Aggies, who fell to 5-14, 1-4. UH — wearing pink socks — broke away in the final five minutes of a tight first half, with Jack Purchase’s two free throws snapping a 26-26 tie with 5:58 remaining and starting a 14-6 run that culminated in a 40-32 lead at intermission. The Warriors then opened the second half with a 9-0 run to stretch the lead to 49-32 after Eddie Stansberry’s 3-pointer with 16:46 let, and UC Davis could not get closer than 10 points the rest of the way. 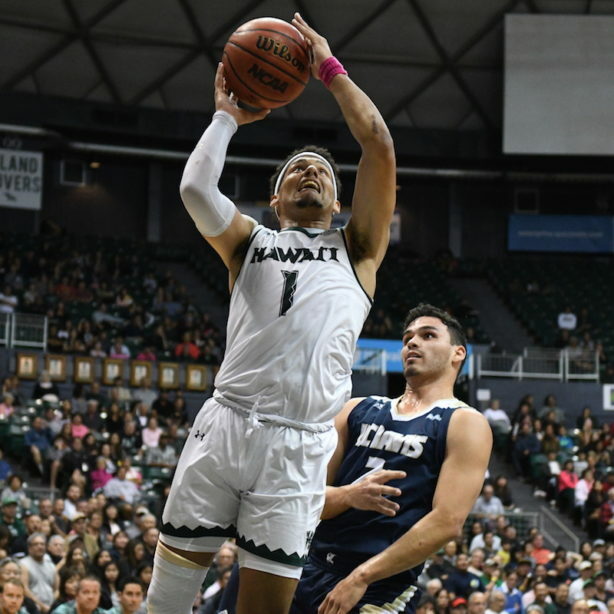 ” That was a really big win for our team, with what was on the line — coming off a difficult loss (in overtime to UC Irvine on Wednesday) — you gotta respond real quick, against a championship-caliber program coming in that had time (seven days) to prepare for us,” Hawai’i coach Eran Ganot said. “But it’s been coming on for our team, I think we’ve been playing well, we could be 5-0 (in conference) but we’re not, it is what it is and we’re 3-2. But you could easily hang your head because, ‘Man, we’re so close, and that’s a tough loss,’ and things like that, but our guys didn’t have any of that, even in the locker room after and the next day. Drammeh scored 15 of his 18 points in the first half, on 6 of 8 shooting including success on all three attempts from 3-point range. 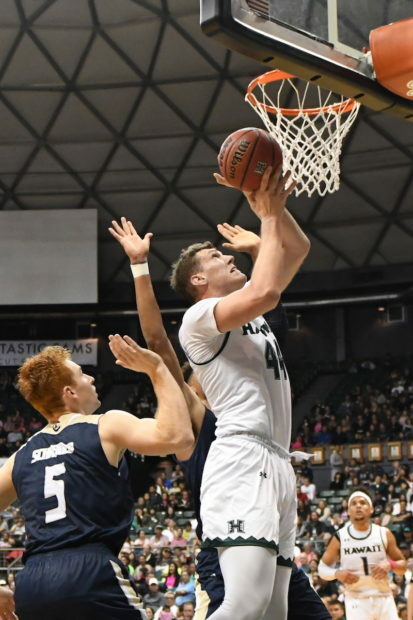 Carper, a 7-foot freshman from Colorado Springs, Colo., came off the bench and played a key role especially after Raimo was whistled for his second foul midway through the first half. After Purchase broke the 26-26 tie with his pair of free throws, Carper scored on three straight possessions — including two putbacks — to help push the lead to 34-27. Carper entered the game averaging 1.1 points per game, and his previous season-highs were four points and two rebounds. Purchase started the second half with back-to-back 3-pointers, the first from the left corner and the second from deep on the right wing, and then Stansberry swished his 3 from the right corner to stretch the lead to 49-32 with 16:46 remaining. The Aggies later used a 9-4 surge capped by Rogers Printup’s 3-pointer from beyond the top of the key to close it to 56-46 with 11:45 left, and the lead was still at 10 points (62-52) after Neufeld sank two free throws at the 8:51 mark. Buggs answered with a dazzling spin move-layup and then scored again on a short turnaround jumper in the lane, followed by Raimo’s layup to make it 68-52 with seven minutes to go. 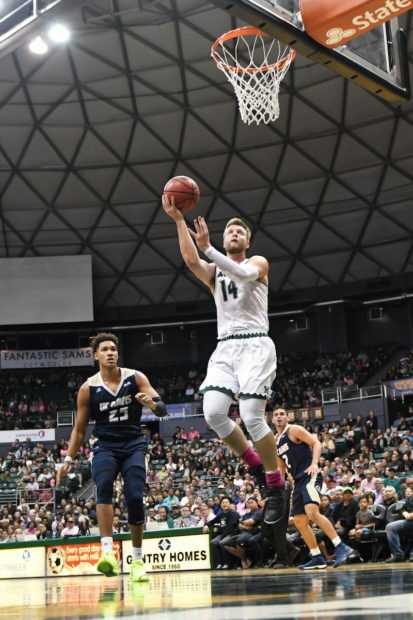 Printup responded with another 3-pointer to close it to 68-55, but Hawai’i then nailed the coffin with a 12-0 run Buggs’ short bank shot that pushed the lead to 80-55 with 2:37 remaining. “Great response by the whole team, as a collective unit,” Buggs said. “We were really disappointed by the loss to Irvine, especially at home — we really want to protect home court, that’s something that is really important in conference. So after losing that one, we just knew we had to bounce back and continue to apply the pressure for the full 40 minutes. We’ve seen in the past, we’ve been up big in all our games recently, and we’ve let teams back in the game. Buggs’ 12 assists is his new career best, and helped lead the Warriors to a .558 field goal percentage. Raimo (6 for 7), Carper (6 for 8) and Drammeh (7 for 10) combined to shoot for a .760 percentage. Ganot said the team is performing well and encouraged more fans to show up in the arena to join the ride. The Warriors’ homestand continues with Thursday’s 7 p.m. game against rival Long Beach State at the SSC.